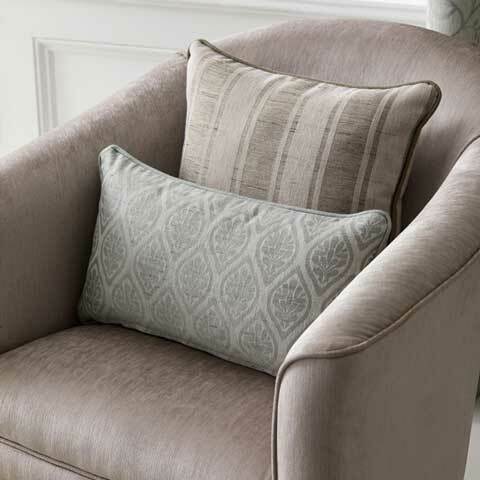 The neutral tones created by Warwick Fabrics in their ‘Amby’ range highlights the effectiveness of adding pattern in the cushions to a tub chair. It is a style that is pleasant and soothing to the eye. Perfect colour palette for a small room or a small area within a room such as a reading nook. You may have a tub chair that needs updating. The ‘Amby’ fabric range may suit your taste just perfect. So, please contact us today to arrange a quote and assistance with fabric selection for your tub chair. Also, we make scatter cushions too so can achieve that same relaxing look featured by Warwick Fabrics.